There aren't enough food, service, value or atmosphere ratings for June Coffee, Virginia yet. Be one of the first to write a review! Near the Embassy suites and Capres area. 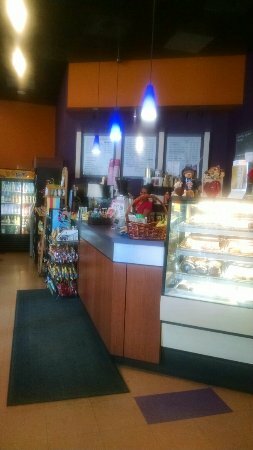 it is great for a quick coffee versus the chains and it is a little cheaper. When I'm close by I always get a sandwich and chips from June Coffee. Friendly ladies behind the counter make my sandwich with great care. It's always good. Wish you were open weekends! Went looking for Starbucks, came upon June's. Mocha is my drink. It was hot smooth and good. No complaints as it hit the spot. Very convenient location to the hotel. June Coffee is located just across the street from the King Street Metro Station, but that's about the only thing outstanding. The food is fresh, but just OK...and might make you wish something little better was nearby. Stopped by and had a fine tuna fish sandwich. The taste was refreshing and the tuna was not overbearing. The wait staff was efficient. Love June's. Convenient, clean, nice place to run in and get a quick sandwich, drink, etc. Owner and staff are friendly too. Get quick answers from June Coffee staff and past visitors.